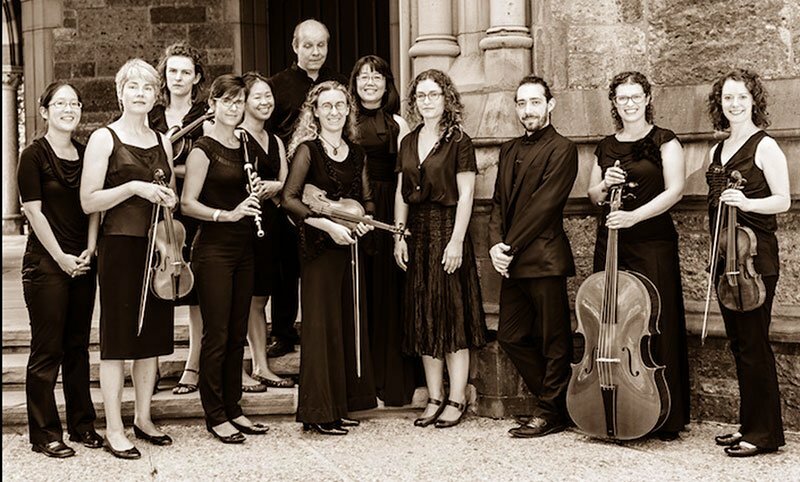 Les Bostonades celebrated its tenth anniversary in exuberant and gladsome style Friday at a packed Gordon Chapel, a perfect setting for this baroque band of 10 with two guest soloists. The sounds evident in the opener, J.S. Bach’s Brandenburg Concerto No. 2 in F Major, BWV 1047, showed a group adhering to early music doctrines of transparent layering of un-vibrated, but certainly not un-enthusiastic expression. The generally dangerous two-on-a-part strings (with one bass) revealed some disagreement about pitch with each other and with the temperament of the harpsichord (one manual with two registers by Yves Beaupré, Montreal, 2007, after an anonymous Italian model housed in the Munich Museum, tempered in Young). It did not help that natural trumpet player Robinson Pyle landed on the wrong side of his description of the lot of the instrument’s exponents; “Alternating boredom and terror.” He only approximated some of Bach’s demanding notes—of course few could do apparently much better on this refractory instrument employing embouchure alone. The other soloists, period oboist Christopher Palmeta, recorder player Héloïse Degrugillier, and violinist Sarah Darling had no trouble with their early instruments. Sebastian, of course, knew exactly what he was doing in this very familiar desert island composition. The solo individuals and groups interacted with each other and the ripieno in the liveliest concerto grosso style just as the master would have wished; a delightful give and take in the allegro proved most welcoming and celebratory. The andante, delivered as a brisk walk with perhaps a too uniform tempo, gave the trumpet a chance to rest. 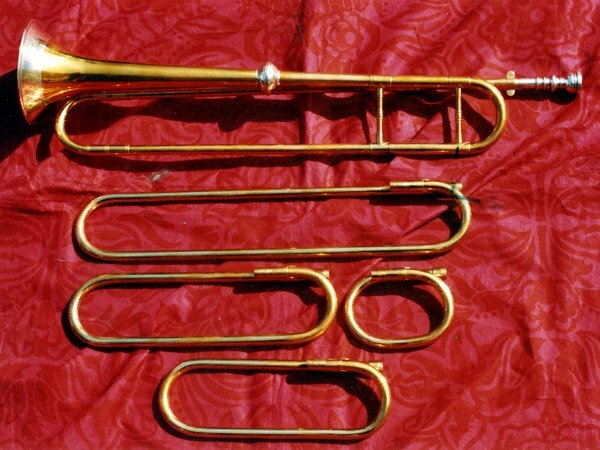 (Baroque “natural” trumpets cannot play readily in minor keys.) In this movement Darling’s completely engaged and outgoing violin consorted with the oboe and recorder to fine effect, though it must be said that the restricted dynamic range of the latter two limits their expressive possibilities. In the final allegro, Pyle’s fallibility, in what some deem the most difficult natural trumpet part in the canon, contrasted once again with an otherwise confident and outgoing if not entirely canonic reading. Darling, as always, was the one to up the ante. Carl Philipp Emanuel Bach, the godson of Georg Philipp Telemann (whose work would follow), famously wrote a number of brilliant concertos. In his D Minor Harpsichord Concerto Wq 17, he is clearly looking back at the baroque gestures of his father and godfather and ahead to the Sturm und Drang. Others see influences in operas of his older colleague at the Berlin court Carl Heinrich Graun, maybe also Quantz and King Frederick himself. Citing antecedents is not entirely fair, though, since Phillip’s unsettled style is sui generis. Akiko Sato ripped through the solo part with great chops and unpredictability, her instrument carrying strongly with ample fundamental in the resonant and supportive space. If the upper strings perhaps whined, they also made lucid points. In Vivaldi Seasons-like manner their hearty digging-in gave fine support to Sato’s flights. We wished for extensions of her short cadenzas. Muted strings opened the Adagio in plaintive song, which repeated and re-charged with building flair until the harpsichord answered their call with a vivid solo commentary, all perfectly in support of Phillip’s alternating quietude and fire. The extended dialogs between the soloists and lower strings at the end breathed deeply and with spontaneity, including the recorder’s charming coda. The strings delivered pure red meat instead of boiled vegetables for the concluding allegro. Rapid passagework from the harpsichord defied the laws of physics. Sato would have leapt out of Earth orbit had the grounded strings not extended their sinuous musical tendrils. We got plenty of notes delivered with plenty of surprises in this successful outing. Les Bostonades’s Telemann gave us every drop of sparkly wanted for this top 40 divertissement. The concerted groupings, soloists and continuo interacted with winning verve, delivering rhythmic inevitability and engagement that allowed this structured foam to banish all cares.